Here are some upcoming club competitions that players can take part in, before the league season kicks off in January. Both competitions are open mixed singles events, and you can enter for them online. Loop TTC are running a Mini Tournament this Sunday, 18th of November. This is an open mixed singles event and is limited to 32 players. Loop TTC are based in Ardscoil La Salle in Raheny. Click here to view location. For queries on the event, you can contact the organiser at 087 7964227. The end of season presentation night takes place this Saturday, 28th April, in Leinster Cricket Club at 8pm. Sandwiches will be provided on the night and there will be no charge. The full list of individual and team winners is available to view here: click here to open. Pictured above is Leixlip 1, sponsored by Toyota – Liffey Valley, who won the Division 2 league title. The end of season presentation night has been confirmed for Sat 28th April, in Leinster Cricket Club. More details will be announced closer to the event. 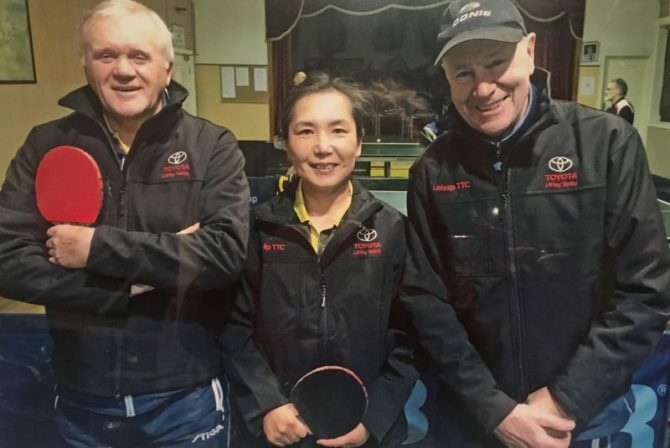 The Annual General Meeting of the Leinster Table Tennis League will be held on Thursday 14th September 2017 in Leinster Cricket Club (Bowling Pavilion behind main club house) at 8 p.m.
MINUTES OF PREVIOUS A. G. M.
Best of luck to the 16 Irish players travelling to Helsinborg, Sweden this week for the 2017 European Veterans Championships.